Today I’m welcoming Nicolas Kublicki to my series of author interviews. Nicolas is the author of The Diamond Conspiracy, in which Justice Department prosecutor Patrick Carlton discovers a decades-old conspiracy to control the world’s production of diamonds. 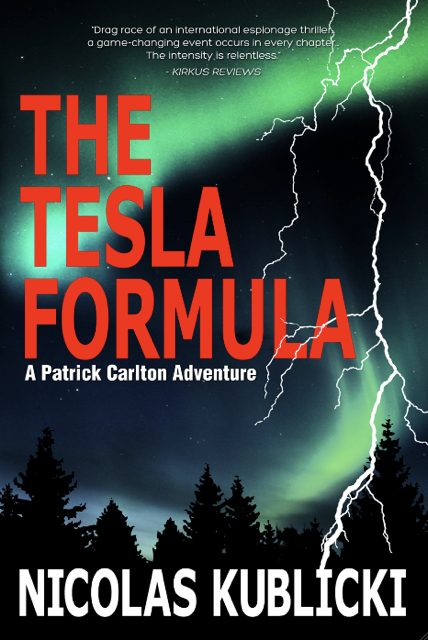 His most recent Patrick Carlton novel is The Tesla Formula, published last winter in e-book and releasing in November of this year in print. Elizabeth: Can you tell us a little about The Tesla Formula? Nicolas: The Tesla Formula is an international thriller about economic and energy terror. When genius inventor Nikola Tesla died in the midst of World War II, the FBI combed through his secret research – and discovered an invention so extraordinary that the agent could only reveal it to President Franklin Roosevelt in person. He didn’t make it. The government never found what he discovered – but a Hollywood star murdered by the Nazis left a clue. When a cabal of rogue Saudi princes conspires with a global energy giant, power-hungry EU officials, and a corrupt Washington law firm to devastate the United States’ economy without shutting off a single oil tap, it is up to Justice Department prosecutor Patrick Carlton to track down Tesla’s lost formula before it is too late. But others want it first. Q: What inspired you to write The Tesla Formula? A: 9-11. I was on the island of Capri in Italy editing The Diamond Conspiracy during the tragic events of 9-11. My girlfriend at the time, who is now my wife, was a flight attendant and often worked on one of the hijacked flights. It took me some time to discover that she was safe. All Americans have had to work through the powerful, roiling emotions that the terrorist attacks triggered. As a writer, I did it through writing. The Tesla Formula is about many things, including a lost formula of Nikola Tesla, the global economy, alternative energy, and the oil industry, but at its heart lies a terror plot against the United States. Unlike the violence sown during (and since) 9-11, the plot involves a global terror plot that will devastate the United States without violence, which sadly is a very real possibility. Elizabeth: In what ways is main character Patrick Carlton like you? Nicolas: An excellent question, since authors so often write about themselves. In my case, I am a blend of Carlton and his best friend, billionaire reformed mafia don Max MacLean (minus the billionaire and mafia parts). Like Patrick Carlton, I am a lawyer, worked at the US Justice Department, lived in Washington, DC, have a law degree from George Washington University, love vintage automobiles, cigars, and Frank Sinatra’s music (he was my neighbor when I was a child), am both a patriot and a romantic, like to confront things head-on, and do things by the book. Unlike Carlton, I neither grew up on a farm nor wear cowboy boots (nor have as much hair left as Carlton). Perhaps my greatest difference with Carlton is that I am not in the Navy Reserve, although I almost was. I had filled out my Navy Reserve application at the same time I had received my admission to law school. My mother expressed concern that it might be difficult to study law and serve in the Reserve at the same time. I decided that she had a good point and shelved my application, which I ended up never submitting. My mother was trying to be the voice of reason and she might indeed have been, but I regret my decision to this very day. In that sense, Carlton’s Navy Reserve service constitutes an unfulfilled longing. Elizabeth: What do you see happening to Patrick Carlton next? Nicolas: Patrick Carlton is facing all sorts of adversity in his third adventure – which I am currently writing – as he uncovers, then fights to stop another global conspiracy. Nicolas: Tortured. I collect sparks of ideas whenever they hit me, then choose one I like best and begin with a general plot, then perform a great deal of research about its constituent parts before creating an outline. I write until I have a completed a first draft. Following the common adage that writing is mostly rewriting, most of my effort and time are spent editing and rewriting my draft. I wish that I could be more precise and detailed in my outlining so I could avoid the incredibly long and tedious process of editing and rewriting, but I find that once I begin writing, the story reveals itself organically, far better than if I simply wrote a top-down, detailed outline. In a sense, I discover the story as I write it, which is a far more magical experience – and for me produces better writing – than outlining, although it takes so much longer. Elizabeth: How much historical fact and other research are woven into your novels? Nicolas: History is very important to me, most likely because my parents are immigrants who lived through World War II and because I attended a French school in LA from kindergarten through 12th grade, where history holds a special place within the academic pantheon. My father was 19 living in Poland when World War II began. He hid a Jewish woman during the Nazi occupation of Poland, for which he received Israel’s Yad Vashem Righteous Gentile award in 1998 (she passed away two years ago and my father turned 93 in September). My mother was a teenager living in Nazi-occupied France during the war. My maternal grandfather was a French soldier who spent the duration of World War I in the trenches and survived the Battle of Verdun. I proudly display his medals (including the Croix de Guerre (war cross) and Medaille Militaire (akin to our Purple Heart, for being wounded in battle three times), dog tags, and WWII French Resistance armband in my office. I also travel to Europe regularly, where it is impossible not to see history everywhere (I visit my maternal uncle who turned 98 in September. He was a French soldier captured by the Nazis and sent to perform labor in Germany. He escaped and walked all the way back to Bordeaux, walking 30 kilometers each night, sleeping during the day). Many of us ignore history and focus on the here and now, which I find not only unfortunate, but a recipe for disaster. For me, history constitutes part of the present because it is how we got to our present. We owe so much to so many who made life in our country today possible. So history always finds its way into my novels, although they are present-day thrillers and not historical fiction. In addition to history, I include many other researched facts in my books that I think readers will enjoy and that I believe lends more realism to the stories. Many editors and agents assert almost as a mantra that a thriller must deliver entertainment not knowledge. They say that because information delivery tends to slow down the high-speed, white-knuckle character of a thriller. Yet there are methods to deliver information without such a decelerating effect. I believe that if my readers are willing to pay for my books and invest the time reading them when there are so many competing demands on their time and money, I owe them more than simply a good yarn. I want my readers to finish my books having learned something of interest and of value. In The Diamond Conspiracy, that includes the history and processes of the diamond trade, Russia, South Africa, the Vatican, antitrust law, and the military. In The Tesla Formula, that includes Nikola Tesla, Old Hollywood, the international economy, the oil industry, astrophysics, alternative energy, terrorism, Saudi Arabia, Poland, France, and the European Union. Nicolas: I like to say that I am half French (mother), half Polish (father), and all American (born and live in the US). My father escaped Poland to get away from the Soviets at the end of World War II. That and his wartime experiences marked him for life. Many of his and my mother’s wartime experiences left indelible impressions on me. During college at UCLA, I studied political science with an emphasis on Soviet Studies. My goal was to fight the Cold War. I worked on Capitol Hill on national security issues before going to law school. During law school, the Berlin Wall fell and Soviet communism was defeated. The Cold War was over. I focused on real estate and environmental law and worked at the Justice Department before practicing law in my native Los Angeles for ten years, then shifted to the business side of real estate. Between the two, I wrote full time, but soon found that having to write on deadline, publish or perish, was detrimental to my writing and far less enjoyable than having to steal away time to write as I had while practicing law. As a result, I write part time, which clearly poses its share of frustrations, but I like to be involved in many things. 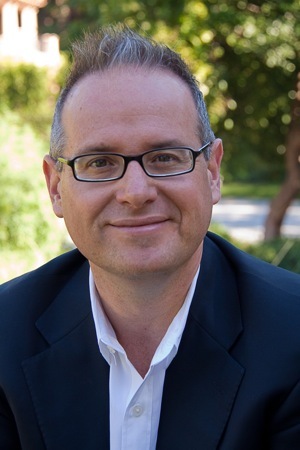 In addition to running a real estate company, I teach as an adjunct professor at Pepperdine Law School, serve on the advisory board of an LA municipal park, and am involved in charity work. I am married, with two young daughters. I particularly enjoy driving my restored 1959 MGA roadster on weekends. I hope to have a vintage Cadillac like Carlton one day. Nicolas: Coffee. Lots of it. Mostly in espresso form that I brew myself. The name ‘quadruple espresso’ is not unknown in my office. Nicolas: I love both, but am more partial to the ocean. In a perfect world, my family and I would hop from place to place chasing a never-ending summer by the beach. Nicolas: Hiking. More accurately, walking. I fell in love with walking as a child during summer camp. Now I walk about 45 minutes daily (although the scenery is not as alluring as the French Alps of my youth). In addition to the exercise benefits, walking sets my mind free and allows it to wander. I often get my best ideas and solve many of my plot and character issues while walking. Nicolas: Neither. My parents forced me to play the piano for years. I was good at it and even gave recitals, but I chafed at being forced to pursue that instrument. It was my first rebellion. The organ is my favorite instrument. Nicolas: Mystery. Although thrillers would be more precise. Thrillers are often lumped in with mysteries, yet they constitute a distinct, separate genre, which the International Thriller Writers organization of which I am a member is working hard to rectify. To me, the main difference between the two is that in a mystery, someone is killed and the protagonist attempts to find out who killed the victim. In a thriller, the protagonist is being hunted while uncovering a mystery. Elizabeth: Joan of Arc or Eleanor Roosevelt? Nicolas: Love. Although in thrillers, death scenes are more prevalent. To learn more about Nicolas Kublicki and his novels, visit his website at www.nicolaskublicki.com and The Tesla Formula page on Facebook at https://www.facebook.com/pages/The-Tesla-Formula/344451525570199. Thanks for visiting today, Nicolas!